After the success* of "Penguins Are Attacking Your Dude!" I thought I would get back into MMF "programming" again. After a while, I got off my arse and started doing something. 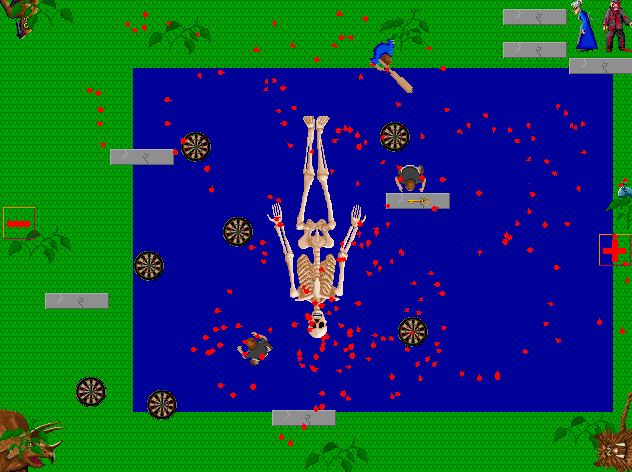 An hour or two after that, Grand Theft Shmup v0.01 was born! - Game should be at least vaguely in the Shmup genre. - Game should be enjoyible and complelling from the first go. - Game should be pick up and play. To be more specific, the player should be able to play the game is short bursts. - Game should use the ship stealing mechanic to good effect, using it to give the player many options in gameplay. - Game should be deterministic. If the player enters the same input 5 times, she should get the same result 5 times. Please tell me what you think of it! *=I finished it, about 5 people played it, and no one has sued me or burned down my house yet, so it was a success! I intend to start working on another game this week. It's looking like it will be a sequel to Freestyle Box 2007 but if I change my mind it will most likely be a two player racing game like Dashin' Desperados if anyone remembers that. And you can pretty much count on it using the neo 8-bit visual style I've adopted for all my games. I'll blog it this time since I am pretty much through disguising blog posts as regular topics. Well while I totally fluffed up this month's KoTM, I still have a chance to provide the whole bleedin' lot of you with a gift for klikmas. Although probably not one as delightful as Pizzatime's gore-behind-every-door Advent Calen-dong. you'll think you're getting mad at frustrated at the idiot fairy, but really you're getting mad at the idiot programmer and his bad excuse for a physics engine! 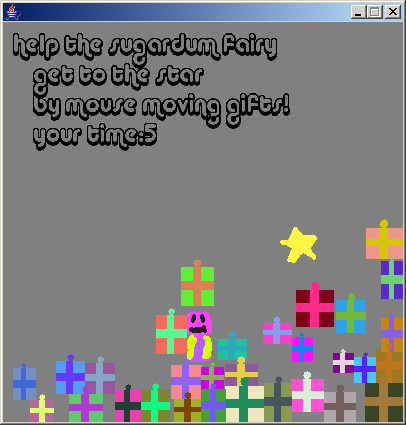 drag gifts to help the fairy jump and get to the christmas star. Penguins Are Attacking Your Dude! So you've got to punch them in their faces. Right? This was made for the KotM club Dec 2007. It feels good to make a game again. I'll have to crack open the MMF again. I kinda like some of the ideas in this, I may revisit some of the mechanics later. Invaders is close to completion! At least the first final release is, anyway. Many of the bugs that were plaguing the game (A galaxian/galaga/space invaders-style shootemup) I've been able to fix, but there are still a couple issues to be ironed out. Hope to have a final release build ready for christmas or the new year! (You can also play it online). 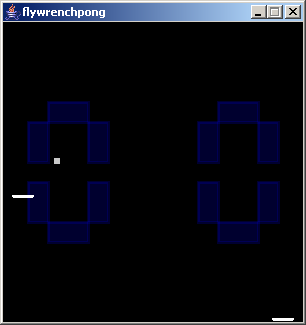 I think if I died tomorrow, the # of people who "get" the joke because of familiarity with both indy game flywrench and atari homebrew joustpong would go down by about 33%. And yes, I made this exact same post nearly on TGQ and indygamer.blogspot.com. hey guys whats going on in this forum? So anyway after seeing insert credit's forums rise from the dead again, I checked out the 'Development Forum' and after a post about The Games Factory, Rerorero pointed me here. As soon as I get the hang of posting stuff, maybe I'll upload my space invaders/galaga/galaxian clone, at the moment simply titled 'invaders'. (I'll probably decide on a name once it's ready for release, but at the moment Invaders would be... y'know I don't know if it'd be considered a 'tentative title' or a 'working title' anyway that's what I'm calling it. Hopefully I'll be able to check out some of your guys' stuff, so see you around! draggin: my first processing game with SFX! So here is my first processing game w/ SFX. I just liked the movement feel of that, but I'm not sure I did a great job of capturing that in the game. You drag your draggin around defending yourself and your precious apples from marauding dot villagers.